describes a container of user actions. No assumption is made about any graphical representation: You could have a menu or a toolbox working with the same container describing their entries. allows foreign components to register themselves as listener for the container structure. provides access to the entries of a menu. The element type is com::sun::star::beans::XPropertySet. 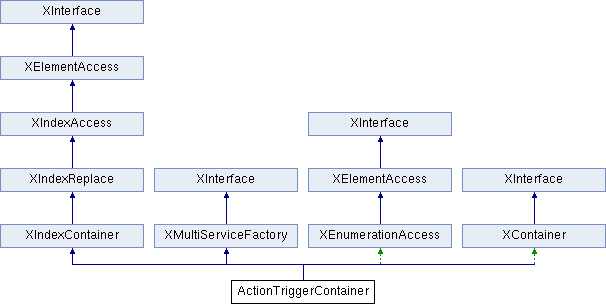 The property set contains attributes like CommandURL, HelpURL as defined in the service com::sun::star::ui::ActionTrigger and optional a com::sun::star::ui::ActionTriggerContainer. creates elements to be inserted into the container.